We believe strongly in linking history with place; in knowing where what happened. We can only value our surroundings when we know why they were important to those who came before us. Hence the whole audioguide thing! Here is a post about a building that doesn't feature on #SuffragetteCity (out in December! Sign up for news here), but which is no less a vital landmark in the history of women's fight for votes a hundred years ago. Read on to find out why. Thanks Google Maps. This is what the building looks like today. At 42 Pearse St, an address that used to be 52 Great Brunswick St, and what today is offices for a digital company, was at the turn of the twentieth century known as the Antient Concert Rooms. It’s actually a late Georgian building from 1824 which had been built as the headquarters of the Dublin Oil Gas Light Company. Its use changed within twenty years, when it was bought by the Society of Antient Concerts, who built a theatre inside. Antient being another version of the word ancient, they were referring to old classical music, such as that by Mozart, Handel etc. They ceased their lease on the building in 1864, although it was still known by the name, and continued to operate as a theatre. The building was known well to later Dubliners as the Academy cinema. Members of the Irish Women's Franchise League. Thanks Dublin City Libraries and Archives. Source link. The Irish Women’s Franchise League was established by Hanna Sheehy Skeffington and Margaret Cousins, in response to the new militant and guerrilla atmosphere in the British groups. The IWFL was inspired by and modelled on the Pankhursts' WSPU, where the motto was ‘deeds not words’, and Margaret spent three weeks with them in 1909 to see how it all worked there. The IWFL was formed on the 11th of November 1908. 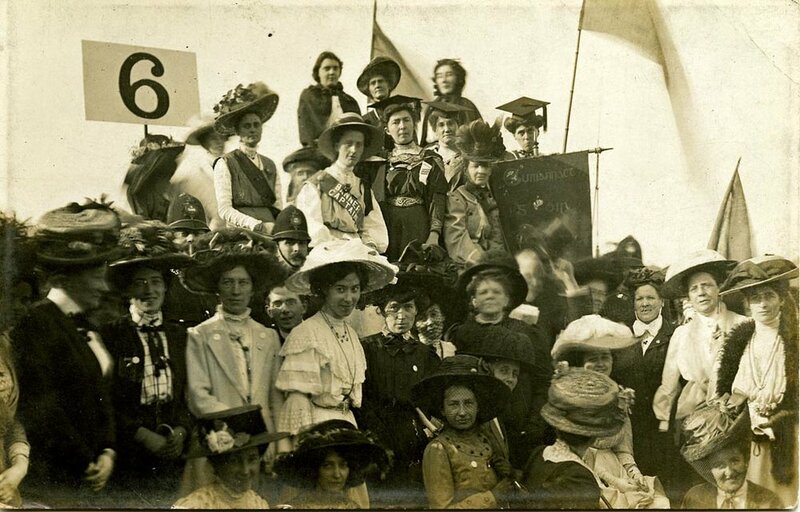 Now there were two large, well-supported groups of suffragists in Dublin - the Irish Women’s Suffrage and Local Government Association (the new name for the long-established Dublin Women’s Suffrage Association), and the brand new Irish Women’s Franchise League. Only the latter could be called suffragette rather than suffragist. Letter from the office of the Irish Womens Franchise League in the Antient Concert Rooms to Padraig Pearse. National Library of Ireland. Irish Women's Franchise League poster giving their address as at the Antient Concert Buildings. National Library of Ireland. 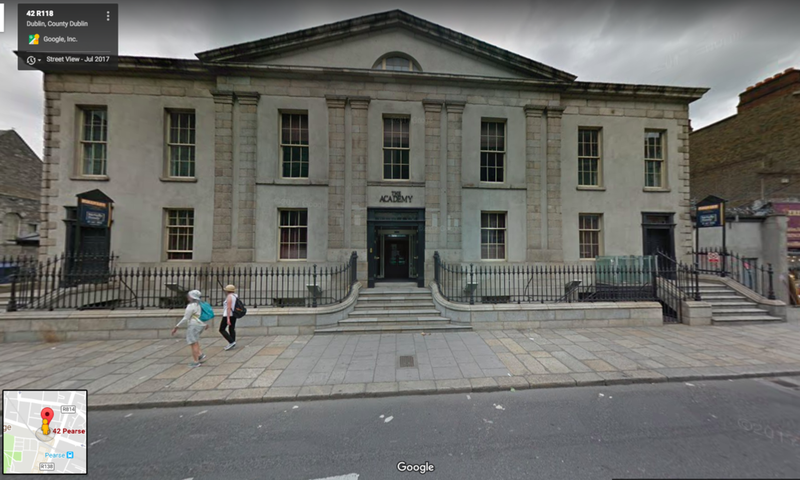 The IWFL office was based in the Antient Concert Rooms, where they rented space from the Independent Labour Party of Ireland. Feminist and socialist activism at this time were always closely linked. The role of the building in the formation and location of the first suffragette group in Ireland remains unmarked as such. Irish Women's Franchise League badge. This is from an excellent online exhibition which was a collaboration between the Google Cultural Institute and Trinity College Dublin. Experience it at this link. When Is The Centenary of Women Getting The Vote in Ireland?